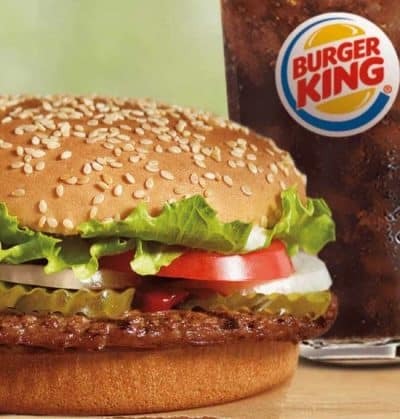 This Whopper Copycat Recipe lets you create the infamous grilled Whopper burger at home. Add in a slice of cheese if you want to go for a Whopper with Cheese. Allow your grill or barbecue to preheat for 5 minutes. Press the beef into a patty about 1/2 inch wider than the buns. Then salt and pepper the beef patty lightly and grill for about 2 minutes on the first side. Flip the patty and cook on each side. (If you are going for a Whopper with cheese then top the patty with sliced American cheese. If not then leave the cheese off). Slice the onions into rings then slice the tomatoes. Lightly toast the inside of both halves of the burger buns and plate them up. Spread the ketchup on each side of the bun and then the mayonnaise .